Colt Harper hates it when you pat a cat the wrong way, or when you upload their faux pas to YouTube. In fact, he'll probably kill you for it. As a self-proclaimed master vampire cat, Colt never imagined he'd be sent to community service at a revolting community theater. And for what? Killing humans who don't buy the expensive brand of cat food? Talk about unfair. Still, working with a nervous werewolf and a monster addicted to tickling wasn't on his to-do list. What's worse, is he's falling for a human. Sure, she has green eyes. Sure, she fosters stray cats. But she's still a disgusting human. So why is he risking his own life to save her from the chasers? This is a story about a cat who possesses humans and then kills those who are mean to cats.....and those who just annoy him... what more do I need to say?! You NEED to read this story for this fact alone! I also loved the extremely funny quotes at the start of each chapter - Colt Harper is one very opinionated kitty!! 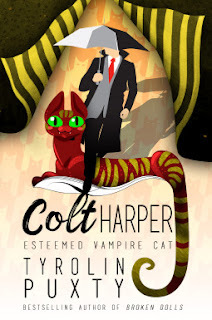 Colt Harper is a very funny, rude, witty, sarcastic but lovable Vampire Cat! And for his crimes against humans he is sent on community service to community theatre!! The perfect punishment but not in his eyes and he's not best pleased when he finds out what awaits him. Along the way he meets up with a werewolf, a tickle monster (yes they exist! ), and other weird and wonderful monsters from his walk of life who are living amongst us! But as he spends more time in his human form, could he be going soft and falling for Saffy at the Theatre - and why is he even drawn to her in the first place?! I have loved the previous Broken Dolls series by Tyrolin Puxty, and this is just as quirky and wonderful as those stories so can highly recommend that if you are looking for a hilarious new character to embrace, then Colt Harper is your cat!! And I was very pleased to find out that there will be another story about Colt to follow! !